1) It seems Frank is the likely one going home this week. What are your thoughts on that, and him being the first veteran evicted? Taylor: I am so devastated that Frank will most likely be the first vet evicted. I am a such a huge Frank fan, I hate to see him walk out the doors. I think James made a mistake putting him up. I’m sure they’re going to start targeting the “couple's” next, which will put James and Natalie at risk, he should’ve left Frank in the game, who is a big target, that would’ve been loyal to him. Kaitlin: It’s disappointing to see Frank evicted so early this season. Out of all the returners he was the most deserving of the second chance. Frank is an All Star but he hasn’t been playing an All Star quality game this time around. He started off fine but then he got too cocky, looks like he was outsmarted once again. Ashley: I’m honestly kind of happy about it. I was never a big Frank person and hearing him talk bad about so many people from his season has been really annoying to me. He’s been entertaining to watch this season and definitely helped create a lot of drama but I’m okay with him leaving this week. 2) As we saw last Friday, Victor returned to the game after winning the Battle Back competition. What are your thoughts on that? Is he whom you had hoped to see win? John: First, I loved the battle back comps! They were all great competitions that weren’t a crapshoot/luck type, which I always prefer with stakes as high as returning to the game. In terms of Victor winning, he was not one of the ones I was hoping for. I wanted Tiffany to return, I felt she was going to be able to come back and do the most damage and flip the script. However, since Victor’s return, I don’t mind him back. We will see how I feel about it him though in a couple weeks. Lol. Taylor: He’s not who I was hoping to see, because I prefer someone who can make some big moves, but he is a good competitor. I do like that Vic is back in the game for Paul’s sake though. Paul is becoming one of my favorites, he needs a good friend in the game. Kaitlin: The Battle Back Competition was an amazing twist this season, it definitely was unexpected. To see Victor return was not very surprising, out of all the evictees he had the best shot. Personally, I wanted to see Bronte back but Victor will do. I was happy to get an unexpected twist like this! Ashley: I was hoping to see Glenn return but I knew that was a long shot. Victor was my next choice, keeping in mind it was slim pickings. I really enjoyed the Battle Back episode in general though, I think it was a nice new twist. 3) As we saw on the Live Feeds, Paul found the secret room. What are your thoughts on that? Was that a smart move for Paul? Do you like the power? John: I love the entire premise of the secret room. I have been asking for a secret room for YEARS. The tunnel, the clues, the “power”. I loved it all. I think finding Paul finding the secret room put a HUGE target on his back. He was acting so sporadic when trying to figure out clues, then he figured it out, and instead of patiently waiting for the situation to die down, he went for it and entered the room in front of everyone. Then when he returned from the room, he lied! He had no reason to do any of that. He’s not nominated, nobody is coming after him, he’s not even HOH! Him being so paranoid about finding the room and the lies he told, I think is going to end up coming back to bite him. Taylor: I love that Paul found the room, but I think when he lied about whether or not the other houseguests could go into it really jeopardized his game. I do like the power, I think it will really shake the game up. Even though people will think it’s rigged, I hope Frank gets the back in the game envelope!! Kaitlin: When the secret room twist was put into action, I was glued to my phone checking for updates on who won the prize. I was so happy that Paul won, because he is slowly becoming my favorite, must be because of the power of friendship! However, his erratic behavior after getting the first envelope has put a huge target on his back. What I really love about this twist is that NO ONE knows who got the golden ticket! I think that surprise will be a great twist added to the game. Ashley: I can’t believe Paul was the one that found it! It was really fun to watch it all play out though. I think the twist will be fun. I’m not a big Victor fan or anything but I think it would be hilarious if his envelope is the one that sends him back into the house! Everyone would be livid! 4) Who do you want to see win HOH, that hasn’t yet? John: Honestly, I’d like to see some of the people that are floating along and laying low win a HOH. Maybe Zakiyah, Michelle, Natalie, Corey, even Da’Vonne. Any of them winning would be interesting because it would show who they’re really loyal too and if they're really here to play the game or just have a fun summer and let someone else control their HOH. Taylor: Can I say Frank even though he’s going home? Haha! If not, maybe Natalie. I like James a lot, and I like James and Natalies showmance, so if Natalie would win and keep them both safe that would be nice. Plus, when I was watching the feeds a couple days ago, I heard Natalie tell James she doesn’t trust Paulie. Paulie is dangerous in this game, so it would be awesome if she would shake everything up and put him on the block. Kaitlin: I’d like to see Paul or Da’Vonne win HOH. I really think they would shake up the house with nominations and that’s what this season truly needs. The twists have been great but we need some power moves ASAP! Ashley: I think Natalie as HOH would be really interesting. She’s grown on me so much this season and is probably my favorite newbie this year. Other than Natalie, I wouldn’t mind Zakiyah or even Corey, solely because I think he would keep Nicole safe. 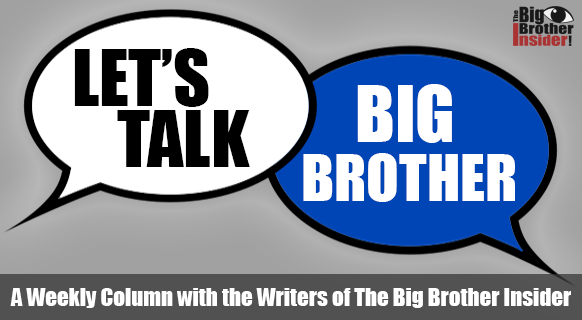 5) There’s rumors swirling online around the possibility of the next season of Big Brother, Big Brother 19, airing as early as this fall, but likely not on CBS - instead online only though CBS All Access. What do you think about that? Love it? Hate it? John: As much as I love BB (and I really do) I don’t like this idea. I’m not a fan of having a season be exclusively online and put together so quickly. If they planned it through and really did it right, maybe it could work, but right now I’m skeptical. Taylor: I LOVE the idea of a fall season of Big Brother, but I’m not a fan of the online through CBS All Access idea. Call me old school, but part of what draws me to Big Brother is the fact that my parents and I sit around the TV three nights a week to watch it together. Unfortunately my parents are not going to watch it online. I think that it needs to be on TV like it always has been. Kaitlin: As much as I love Big Brother, I’d love to see it on all the time. But I would not watch it if it was solely on CBS All Access. I do not like to watch my shows on the computer, I love my good old fashioned cable TV. And if CBS does this they could potentially lose a lot of fans and viewers because not every fan would have access to All Access, and I think people will not buy a subscription just to watch a fall season of Big Brother. Ashley: I’m always all for more Big Brother! I’m just not so sure I believe it. I would definitely tune in. I just worry the rumor is just a rumor to get the internet swirling. Time will tell I guess!